Travelling is one of my passions and once you get the bug you really can’t stop. 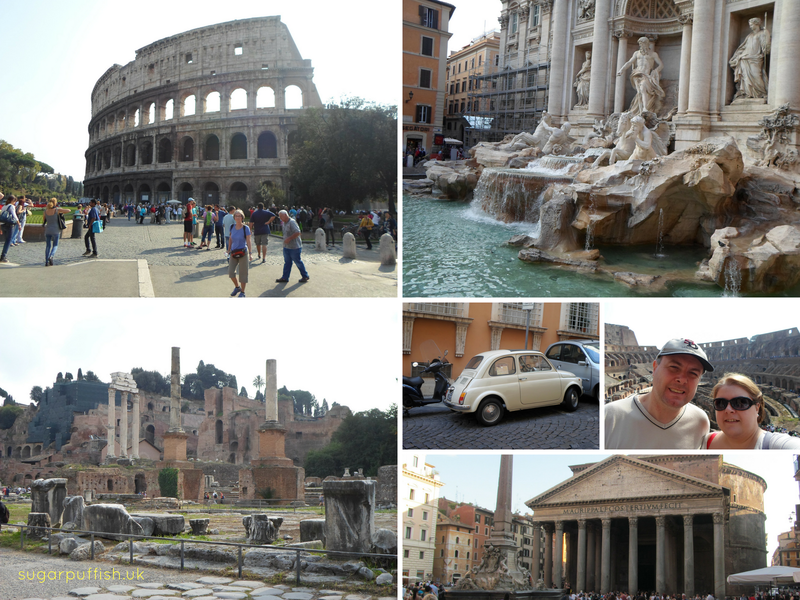 I am fortunate to have seen many cities around the world and this week I visited Rome, Italy. I guess this blog post is the modern equivalent to popping over to my place for nibbles and a holiday slide show. Let me start with a few basics details which could be useful for planning your own trip. We ended up catching a bus from Fiumicino airport to Termini Station. There were a number of shuttle companies competing for our Euros. You simply buy tickets from booths in the terminal. We paid €5 each with TAM and on our return journey we picked up the Atral coach for €4 each. We stayed at The Blue Hostel which is “a hostel with hotel style rooms”. It is situated near the Termini Station in a typical Italian apartment block. We were in a flat that had been converted into a couple of double rooms. I can not fault the accommodation it was clean, modern with en-suite, TV, free WIFI and air conditioning. There were a couple of minor issues which I think are worth mentioning. You have to be prepared to trek up three flights of stairs not an easy task after a day of sightseeing and we had a couple of power cuts during the night. It only became a problem for us because it kept tripping a burglar alarm which woke us up several times. I would advise taking a torch we did return one evening and had to climb the stairs in the pitch dark. Our Hostel owner suggested we buy Roma Passes for €30 each. It allows you free entry to the first 2 museums or archaeological sites, reduced ticket prices at other museums/sites and free use of public transport. It was worth every cent when it came to the Colosseum as you get to jump the long queues. Like most cities in the world, Rome has a petty crime problem. Unfortunately, pick pocketing is common place along with beggars and peddlers. You just need to be sensible. Be aware of your belongings; don’t carry valuables or large sums of cash and a money belt is definitely advisable. That’s the practicalities now on to the fun part. We had four days in Rome and the weather was amazing, a very sweaty 26 degrees. My feet were very sore and I gained a few blisters but I still enjoyed myself. We visited the Colosseum, Roman Forum, Pantheon, Vatican City (Vatican museums, Sistine Chapel & St Peter’s Basilica), Spanish Steps and Trevi Fountain. The food was delicious and I found it relatively easy to follow my dietary requirements but I shall do a separate post about my experiences.